This dish of tender stir-fried chicken and roasted cashews in garlic sauce tastes just like take-out, only better. This dish of tender stir-fried chicken and roasted cashews in garlic sauce tastes just like take-out, only better. You don’t need a wok — just a large nonstick skillet — and, aside from the chicken, the only chopping involves some garlic and scallions. The rest comes out of bottles and jars. The only way to mess it up is to overcook the chicken so have all your ingredients prepped before you start cooking and don’t cut the chicken pieces too small (they’ll cook too fast). Also, be sure to use a high-quality hoisin sauce like Kikkoman or Lee Kum Kee. You’ll be amazed how much better it feels to eat fresh, homemade Chinese food — and it won’t take you any longer to cook than it would to call it in and wait for it. To begin, place the cashews on a baking sheet in a single layer. Next, season the chicken with salt and pepper. In a large nonstick skillet, heat 1 tablespoon of the vegetable oil over high heat until very hot. Add half of the chicken to the skillet and stir-fry until lightly browned but not cooked through, about 3 minutes. Transfer to a plate. Add the remaining tablespoon vegetable oil to the skillet; then add remaining chicken, garlic and white parts of the scallions. Stir-fry until the chicken is lightly browned but not cooked through, about 3 minutes. Return the first batch of chicken to the pan. Turn the heat down to medium and add the rice vinegar; cook until evaporated, about 30 seconds. Add the hoisin sauce, soy sauce and water; cook, tossing, until the chicken is cooked through, about 1 minute. Remove from the heat. Stir in the scallion greens, cashews and sesame oil. Place the chicken pieces in a large bowl. Sprinkle with salt and pepper and toss to coat evenly. In a large nonstick skillet, heat 1 tablespoon of the vegetable oil over high heat until very hot. Add half of the chicken to the skillet and stir-fry (stir as you cook) until lightly browned but not cooked through, about 3 minutes. Transfer to a plate. Add the hoisin sauce, soy sauce and water; cook, tossing, until the chicken is cooked through, about 1 minute. Remove from the heat. Stir in the scallion greens, cashews and sesame oil. Serve immediately. I made the cashew chicken, the flavor was amazing! I substituted the onions with celery and water chest nuts. I will not buy this dish from a restaurant again! Thanks for the recipe. I have now made this recipe 3 times and each time it gets better and better. My super picky kids love it (even the 4 year old who swears she doesn’t eat meat lol). My only problem is I can’t seem to get my husband to leave the toasted cashews alone before adding them to the mix :). But this is definitely a go-to weeknight meal, done in 30 minutes or less! Thanks Jenn! This recipe is amazing! My go to whenever we have friends over for dinner. The sauce is so flavourful. It tastes just like take-out but better. It is super simple to make. I always add red peppers and/or zuchinni for more nutrients. Well this recipe is easy and soooo delicious! Seriously the best cashew chicken I have ever made. We cook our own Chinese food because in this college town, Bloomington, IN, we haven’t found anything to compare with what we were used to in Chicago. We used the Hoisin sauce Jenn recommended and I love its flavor – the only change I will make next time is to a lower sodium soy sauce (Tamari). And I will be making this again soon. This is the third recipe I have made and all three were great. Spaghetti pie,Segal burgers now cashew chicken. 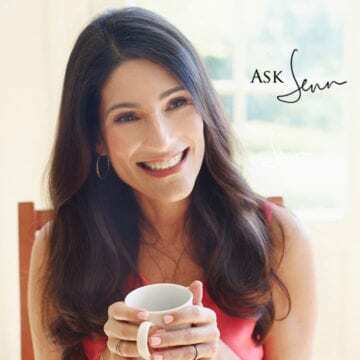 I have tried at least ten of Jenn’s recipes and have been blown away every single time. Her recipes seriously rock. Restaurant quality taste and easy to follow, thorough instructions. We just didn’t enjoy the taste of hoisin with this one. To be fair, I used Dynasty rather than the two brands she suggested so that was probably part of it, but it seemed like four tablespoons was excessive. I would suggest to anyone interested in this recipe to consider using half the amount of hoisin and to smell it before you add it. If you don’t like the way it smells, you probably won’t like the way it tastes. Loved this recipe. It was easy to make and so delicious! After making it per the recipe, I played around a bit and added our personal likes to it. A little crushed red pepper, a bit of ginger and some veggies. This has become one of our favorites. Thanks for sharing. This was delicious! Thank you! I am not a good cook and this came out amazing, followed all of the steps and did not change anything. One thing I would recommend to basic skill level people like myself is to measure out and have all ingredients handy, because it’s all happening fast on high heat. That was some intense cooking compared to the boring stuff I usually make, but it came out so amazing. Will be checking out your other recipes. Really nice recipe. I basically followed the script, but I like things spicy, so I added a tbsp of Schiracha, a pinch of cayenne powder, and some red pepper flakes. This did amp up the flavors very nicely for those who like it spicy. Also, I added a tbsp of Oyster sauce just because I really like the taste of Oyster sauce and always add a tbsp of that LOL I like that this recipe is so simple that it’s easy to improvise on the theme without it becoming a major project. This one’s in my rotation now. PS – like another reviewer, I always add a tbsp of corn starch to the chicken and shake it up in a bag, just to make the meat a little more tender. Family favorite, make this when the family is craving Chinese takeout, much healthier! I mix in broccoli. This didn’t come out at all the way it looks in the picture . Hi Asra, I’m sorry you had a problem with this! Did you make any adjustments to the recipe (besides adding a bit of cornstarch)? I love all your recipes and even got your cookbook from my sister for my birthday ! Just made this for the first time, and it was really delicious! I added 1/2 of a large onion and a whole red pepper, which added a nice color to the dish. Since I was out of Jasmine rice, I used organic brown rice Pad Thai noodles instead, and liked it with them much more than I thought I would. The noodles soaked up the flavor of the sauce and was really yummy! I also made 1/2 more sauce, since I was adding more vegetables. Thank you so much for an outstanding recipe that I’m sure will become a regular meal at our home! Another terrific recipe enjoyed by all – even our daughter who doesn’t love chicken dishes. Another keeper. My husband is typically a picky eater (but we both love Chinese). Was hungry for something home cooked and simple and this was delicious!! His plate was clean in no time. Will be making again!! I really wanted to love this recipe but there was just way too much garlic. It over powered the whole dish and I couldn’t taste anything else. This was really delicious! Super easy, comes together quickly. My hubby and I both loved it. Another wonderful recipe. Loving your cookbook too. Maybe don’t add the cashews til the day you serve. Sometimes they lose their crunch. This was so good, my husband wants it again tonight!! Wow!! Thank you! I added some fresh grated ginger, 1/2 teaspoon of chili garlic paste, and some snow peas! Outstanding!!! I have just subscribed to your blog hoping to find more recipes! Thank you! This was an outstanding dish! I made it last night and it was GREAT! My husband is a picky eater and he enjoyed it. The chicken was tender and the sauce was delicious. Will be making this one again…soon! I made this for dinner tonight. Easy and delicious. Better than any restaurant Cashew Chicken I’ve ever had. My family really enjoyed this recipe and I enjoyed that I could put a healthy, delicious meal on the table in fairly short order. The flavors are great as is. Next time I may try adding some ginger and a small amount of red pepper flakes. I served this over rice and added steamed broccoli to the bowl. Thank you, Jenn! This is a family favorite! I add broccoli and a little more spice. This turned out great and everyone loved it. I used a chicken thighs and although doing so added prep time to trim, it was worth it. This dish was so easy to make, delicious and will be added to our regular rotation of dinner meals!!! I love this dish – it’s in heavy rotation at my house. Love that it comes together quickly, perfect for an easy weeknight meal. Thanks for a delicious recipe! Fantastic recipe! Really tasty and easy to make…my husband said it was like in a restaurant. Thank you! Hello – did this recipe had cornstarch in it before? Not sure if I’m thinking of the wrong recipe or there’s been a change from the last time I made it! Excellent recipe. I usually coat my chicken in corn or potato starch before stir frying. A TBS of the starch in a plastic bag, add the chicken and shake it until lightly covered, then stir fried will make the chicken softer and more succulent. We have made this many many weeknights. Easy and delicious! I made this tonight after trying several other, unsuccessful recipes. I love cashew chicken, but when I order it out it is mostly celery (yuck), green peppers (yuck) and baby corn (double yuck). And there are like 5 cashews. This was DELICIOUS!! I followed the recipe exactly and found the hoisin sauce on Amazon. Thanks for sharing this amazing recipe! Dee-licious! I made this and froze in individual portions for my son who had a broken wrist and couldn’t cook. Froze beautifully. I toasted raw cashews and kept them separate from the frozen portions to add when served so they wouldn’t get soft. I also added a tin of sliced water chestnuts (nice crunch) and the 2nd time I made it, I also added zucchini chunks (it’s summer and I had a few zucch’s I wanted to use). One thing I liked about it was it tasted like real Chinese restaurant chicken to us. Also, I used boneless thighs and served over farro instead of rice- just my son’s preference. Super easy and this will be definitely be in the regular cycle of menus for the family. I stumbled upon this recipe and it looks delicious! I have raw cashews on hand, but not roasted. Are they ok to use in this recipe? Should I toast them longer in the oven? Thanks! Yes, I would toast them longer until they are fragrant and golden. I have made this recipe a dozen times. I do make extra sauce only because my family likes a little extra to drizzle over rice. But this recipe is definitely delicious and tastes way better than any take out! Hi Bret, Cider vinegar would work here also. Enjoy! This is a straightforward and delicious recipe. Turned out great and the family really enjoyed it. Like some of the other reviewers, I added corn starch with the water to thicken the sauce. Absolutely love this dish! I’ve been making it every couple of weeks and the family eats it up each time. My family loves spicy food, so I’ve been adding a little cayenne pepper to the salt and pepper with the chicken and some crushed red pepper with all the liquid ingredients. I’ve also used a little corn starch and water to turn the liquid into a rich, silky sauce. I add some steamed veggies to make sure the kids are eating something healthy. Makes a great 1 pot dinner in 30 minutes. Made last night, we loved it! I did add about 1/4 cup chopped celery and carrot each that I softened in the microwave just because I had them. I used the Kilimanjaro Housin Sauce. My husband had to pick up in St. Louis because I couldn’t find it in our rural area. It was worth it. The is our recipe from now on. I don’t believe I could eat take out cashew chicken now. Would this work with cashews that are already salted? That would be fine, but I’d suggest reducing the added salt to about 1/4 tsp. Hope you enjoy! Wow! Delighted with this very tasty dish, so easy to make. Deeeeeee-lish! Will definitely make again and don’t think I will change a thing. This recipe is fantastic! Quick and easy. I’ll be adding this into our regular meal rotation. Thanks Jenn, for another wonderful recipe. My very picky family loved this dish and they aren’t very fond of Asian food. Keep up the great recipes!!! Hi Pam, each serving of the chicken has 464 calories. I’ve added all of the nutritional information to the recipe if you want to take a peek. Maybe I missed this, but how many servings does this make so I know how large of a serving I can eat for nutritional content purposes? There are 4 servings and each serving should be approximately 1 1/4 cups. 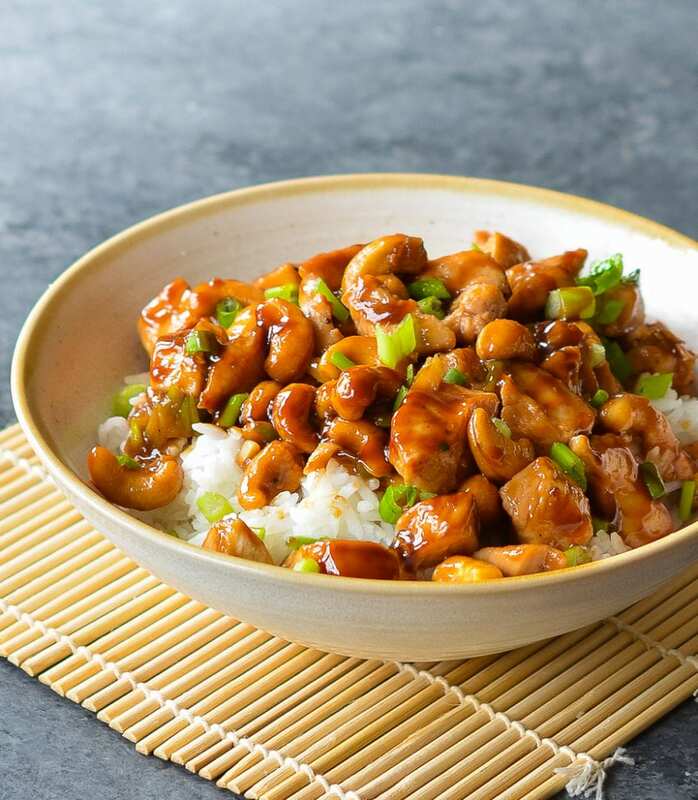 What would be best to use to add some kick/heat to the Cashew Chicken? We usually order “Heat Level 3-4” from the restaurant. Thanks! Hi Kim, you could easily serve this with some crushed red pepper flakes or add some chili paste, such as sambal oelek. Hope you enjoy! Delicious! Reminiscent of Chinese take-out but fresher and much more flavorful. The kids loved it too. The side of steamed broccoli made it a perfect meal. Delicious! Finally, a meal the whole family agreed on hah! I served on lettuce wraps for me and with rice for the kids and hubby. Hi Jen, planning on making this tonight. 2 Qs – I don’t have scallions on hand, do you think shallots, pickled red onion, or regular white onion would substitute? Also instead of white rice am thinking of making your fried cauliflower rice (again, no scallions). Think the combo will work? Hi Donna, You could get away shallots or white onion here if you saute them a bit first. And I think this would be good served with the cauliflower fried rice. Hope you enjoy! This was so delicious! What a great recipe! I always order cashew nut chicken from my local Thai restaurant, but this is even better! yummmmmy! Hi Carol, I’d double the cook time. Hope you both enjoy it! My family and I loved this. I decided to add mushrooms and broccoli just because I wanted more veggies for my guys. I also doubled the sauce. I’m so glad I did because the flavor of the sauce is amazing! Followed the recipe exactly. Even the kids enjoyed it! I am so glad I happened upon this recipe. Great flavor, speed, and simplicity make this a winner. Thank you! Just like every other recipe of Jenn’s, this was absolutely delicious. Can’t wait for the cookbook! This was delicious! Boyfriend approved. We didn’t have white rice at the time, but had sugar snap peas with it. A healthy alternative and they went nicely with the dish! I want to try this, but have a question…why is 1/2 of the chicken browned before adding additional ingredients, and then the second 1/2 browned with them? Hi Danielle, The chicken is cooked in two batches so as not to crowd the pan. If you were to add it all at once, the chicken would steam instead of sear. Loved this recipe, super simple and very tasty! My go too for cashew chicken. Thanks bunches! ? OMG! I made this tonight and it rocks. We make a lot of stir frys and this one is going on the short list. Super easy and so much better than any Cashew Chicken I’ve had at a restaurant. Fantastic combination of flavors. You have so spoiled me again. I already can’t bear any Caesar Salad dressing but yours. Now, I have to add Cashew Chicken to my list. I have made this several times over the past couple years and loved it. However, our family has since become vegan. 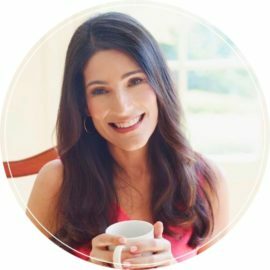 I was craving the taste of this dish and had a brilliant idea – TOFU! I simply warmed cubes of super firm tofu in a skillet and added it to the sauce to simmer. Such a wonderful vegan swap for this tasty recipe! I made this for dinner last night and it turned out wonderfully. I used chicken thighs just because that’s what I had on hand, but otherwise followed the directions exactly. Super quick, easy and delicious! Anyone who had flavor issues possibly didn’t allow the vinegar to evaporate? Or didn’t use quality products? Don’t know, but I loved it. It will definitely be in the rotation regularly for weeknight meals. Hi Jenn, I’m excited to try this recipe tonight, and I have a simple side-related question: You suggest steamed broccoli as an accompaniment, which I love, but I’m curious about how you season it. I often add shredded cheese to steamed broccoli, but I’m a bit tired of it, and I don’t think it would be a great pairing with the cashew chicken. I would love your suggestions for making steamed broccoli more interesting. Thank you in advance! Hi Jenn, you can keep the seasoning for the broccoli really simple– maybe tossed with a little olive oil, salt and pepper. If you wanted to stick with the Asian bent of this dish, you could use just a tiny bit of sesame oil, soy sauce and/or sesame seeds. I love this recipe!! It is so easy and I like easy. Made this last night for dinner. Quick and easy and good!? Made tonight and loved! Only change was I would double the sauce – perhaps I used more chicken than recipe called for (about 6 med chicken breasts). I also added well-done sauteed onions and next time will add waterchestnuts. Really good, easy dish to make! Made this for my partner and a friend we had over for dinner. Used tofu instead of chicken, and slightly less vinegar than called for. This was so good, we all loved it and will make this again! This was hands down the best Cashew Chicken I have ever eaten…..period. It was easy to make and turned out perfect. I’ve tried making several Asian dishes over the past few years and this was definitely a winner. The whole family loved it! Thanks for the great recipe. It was just ok. Ive had better take out. The best part was how easy it was. Rose, I’m so sorry it didn’t turn out as you expected! Did you use rice vinegar and dark sesame oil? Those two ingredients can not be changed and will completely ruin your dish of if not used. Love this recipe! Can you tell me which ingredients you double for more sauce? I doubled the vinegar, along with the other sauce ingredients but I think that changed the taste. I am wondering if I should have skipped the extra vinegar. Thanks. Anne, while I may have done the same thing if doubling the recipe, if you found it to too vinegary in flavor, I wouldn’t double that ingredient– maybe use 3 Tbsp. of the vinegar instead of 4. Another excellent dish! Better than take out – we love this and will be made again. Jenn, keeping to the Chinese theme, do you have a recipe for black bean sauce? Thanks again and again for these amazing and easy recipes. Glad you liked it Janet. I don’t currently have a black bean sauce recipe. If I don’t have a particular recipe, I will often suggest one from another site but, in this case, I didn’t see one that I loved– sorry! Tried this and there was not enough sauce. I notice others sugest doubling the sauce, so I agree with that. I wonder if you could use other meat? Or maybe even ground meat? I think you could get away with using sliced beef like flank steak. Not certain about ground beef, but if you try it, let me know how it turns out! This was delicious! Even a picky eater said so, for once the whole family truly enjoyed a meal. I will definitely make this again! I made it with a fried rice recipe from another blog (gimme some oven) it was a great dinner! I love every recipe I have tried on this site which is saying alot! Thanks for the wonderful recipes Jenn. This is one of my favorite dinners. Is there a way to adapt the recipe for a slow cooker? I made this dish tonight and it was very good. I will definitely make it again but personally I think it needs some more scallions. I will add more for next time. Other than that, it was easy and very tasty. Hi Jen! Can I use low sodium soy? I always get nervous about using full-sodium because you can’t undo the salt level. Just bought everything for this and plan to make this week! Thank you! Ps please keep adding recipes– I’m close to trying almost every single dinner recipe on your site! This is our favorite recipe! I have three finicky children, and each one asks for this by name! Thanks for the recipe….and reason NOT to go to the Chinese food place! Yum! I came across this recipe about 6 months ago and have been making it regularly since. My partner is always requesting this meal! Another out of this world recipe! I love Chinese food – but hate how dry I feel after eating it at our local restaurant. This is delicious! And, you are right – you feel great after eating it. My family loves it and it is now in my regular rotation. This is an easy weeknight dinner for my busy family. I have made it with chicken thighs and breasts – both turned out well. Like some of the other reviewers, I double the sauce to have enough to cover a hearty bowl of rice. Thank you! Growing up ‘Cashew Chicken’ at the local Mandarin restaurant was at least a monthly occasion. Also my favorite one. I have made this twice and both times it was better than any restaurant. As a matter of fact I’m making it tonight to show off for some friends. Thank you for a great, easy recipe that takes me back to a wonderful time in my life. This recipe is fantastic!! I did add zucchini, mushrooms, water chestnuts and red pepper flakes for a kick. Also doubled sauce. Would highly recommend. Such an easy dinner to prepare and is full of flavor. I had a zucchini, so I diced it up and added with the second round of chicken. Best part of this dish was I had leftovers and when I reheated it at work, I had several people comment on how good it smelled and wondered where I got this meal. Wow! I never leave reviews; your cashew chicken recipe has ‘forced’ me to comment. :O) This was so delicious! Recently, for the first time in years, I ate some cashew chicken at a local chinese restaurant. This recipe just blew the restaurant offering out of the water. Thank you so much for sharing, Jennifer. What a great looking recipe! For those who need to eat wheat- or gluten-free, it could be made with Wok Mei hoisin sauce and gluten-free soy or tamari. Thanks for the info on Wok Mei hoisin sauce. I use Tamari regularly, but didnt have a gluten free alternative for hoisin! YUM! did recipe as is… only added more veggies. YUM! I forgot to rate this recipe… Plus a few more stars! This recipe is AWESOME! I have made it twice this week! I am redeemed in the eyes of my sons! Will continue to follow you! So easy and delicious! I added water chestnuts and broccoli, and served it with brown rice. Thanks for the great recipe! Super excited about this recipe! Can I substitute coconut aminos for soy sauce? Hi Janette, I’ve never tried that product but it should work. Best Cashew Chicken recipe!!!! I would make a little more sauce next time, especially since I added water chestnuts. So yummy!! Thanks for the great recipe! I made this dish a couple of weeks ago. I followed the directions exactly. I used sliced cashews instead of whole ones. My husband and I absolutely loved this dish. I served it with white rice and homemade crab rangoons. Delicious!!! Great recipe; thanks so much for sharing this. Two thumbs up from my husband, not only because he LOVED the dish but also because there was only 1 pan to wash! This dish is beautiful! I don’t even like cashews but I loved this dish!! Amazing!! This is the second recipe I have tried from this website and it was another hit with my family. Everyone loved it, even my 4-year-old. I paired it with Rachel Ray’s lo mein. Made this dish last night and it was AMAZING!! I don’t usually like Cashew chicken but I tried it because I read the reviews and Im so glad I did… will be making this again! Such a simple set of ingredients for such a great tasting dish. So much better that I’ve ever had at any chinese restaurant! New Year’s Eve is always Chinese food and this recipe sounded great. By far it was the best cashew chicken I have ever eaten. It is 10 times better than a restaurant. Thank you for making our celebration a success. Excellent!! I’ve been hunting the Internet for Chinese and Thai recipes for 6 mos and I have been severely disappointed. This recipe I’m keeping!!! It’s scrumptious!!! Thank you – send more! Wonderful! The only change I made was to add water chestnuts. Jenn, your recipe is fantastic! I only wish there was a little bit more sauce. If I want to make more sauce, should I just double the rice vinegar and let it evaporate and then double the hoisin, soy sauce, water and sesame oil? Yes, that should do it, Michele. Please let me know how it turns out. I have made this several times for my family. I have 2 young kids and they love it!! I have given to several friends and they have said it was a success in their home too! Made this dish last night for dinner. Wonderful flavor and so easy! This is a keeper. I made this with tofu instead of chicken and added a few more veggies. It was very delicious-definitely restaurant quality!! I have tried numerous Cashew Chicken recipes but this one is by far the best! Thank you for sharing it. SO GOOD! And so fast and easy. Great recipe! Thanks! Love this quick dish. Usually when I stir fry it’s just playing it by ear. . .throw it all in, stir and serve. This recipe shows me that order matters. (ie, working the chicken in batches, letting the vinegar cook off before the hoisen/soy sauce, etc). I’ve added this recipe to muscle memory so I can pull it together quickly. In addition to the salt and pepper for seasoning the chicken, I sprinkled some corn starch in to coat it as well. I like how it gives it more texture, and browning. I serve it in a bowl, over rice, with edamame squeezed out of the pods on top. Dash of sriracha for a lil spice, and it’s become a favorite –into the rotation! PS. This is the first main dish I’ve tried from the site, but I also have enjoyed the chai-spiced banana bread, the black bean and corn salad with chipotle/honey vinaigrette, an the strawberry and orange salad with citrus syrup and mint! I love this recipe! I added vegetables (broccoli, sliced carrots, peppers, mushrooms and onions) to it so it was a “complete” meal (nutritionally speaking). Will add this recipe to rotation! This is a handy recipe to have when there’s not much in the fridge to whip up a meal: it’s quick and easy to make, and there’s so few ingredients required to make it. My toddler kids and husband really like this dish, and also makes for a great leftover lunch as well. I find the sauce is a little on the thin side, so I add some potato starch dissolved in water to thicken the sauce a little, and also decrease the amount of water that’s called for in the recipe. Something is definitely not right with the sauce on this Cashew Chicken recipe. I eat Thai food all the time and was expecting something similar to Thai Cashew Chicken but the sauce was way too sweet and cloying. Please tell me where and how to locate your other recipes. If all are great as this Chinese stir fry one then your other recipes are a must for me. I am 80 yrs old and still enjoy finding new recipes. This is on my menu for this week!!! Could you make extra and freeze it? Hi Mandy, I hope you enjoy the chicken. To be honest, I’ve never tried freezing it but I think it’s probably best made fresh. Maybe it was the hoisin sauce that I used (Dynasty — I couldn’t find the recommended ones), but something was off with the sauce. Hi Adora, I think you’re correct…hoisin sauce has a very powerful flavor and it’s important to use a good one. I have not had great results with the Dynasty brand. I have a brand of Hoisin sauce called K.A.M.E from an organic foods store. I hope this works because I cannot buy the brand suggested. I dont know its quality, all I know is its expensive. This recipe was amazing! So tasty! My husband and I are fighting over who gets the leftovers for lunch. I will be making this again! I just made it…Delicious & so easy to prepare! I have made this dish many times and each time tastes better than the last. I use chicken tenders and throw in a few extra cashews, delicious! Will definately be adding this dinner rotation. So easy and quick! We loved it! This is my first time at your site – my wife came across this recipe on Metrocurean and I made it for dinner tonight (Jan 2013 – nearly 2 years after the recipe’s debut!). The dish was spectacular and came together very easily. I followed it to the letter. Thank you so much. I really must applaud the fact that not only did you create a stir-fry without the use of ginger (which is not missed here), but you also didn’t call for dry sherry, which for some reason a lot of stir fry recipes ask for. I don’t know why this is, considering a decent bottle of dry sherry costs $20 in the MD area, and recipes only call for a Tablespoon at most. I’m appreciative of the fact that you found a way around this. The flavor was wonderful. Many thanks! Looking forward to trying your other recipes. came out a lot better than I thought. Usually when you make your own Chinese food( or when I do) it is never close to what you get at a restaurant. This came out very good. Made this tonight. It was delicious & light. I will definitely repeat but will double the entire recipe. looking for further recipes – these look wonderful. Made this tonight…. delicious! Thank you for the recipe. I had to use Dynasty Hoisen Sauce because I can’t have gluten. Thanks! Made tonight for the first time. Delicious and kid approved! Great base recipe. I thought the sauce needed more punch so I ended up adding a bit more soy sauce to taste. Great recipe! My 2 and 4 year old love it! It goes great with basmati or jasmine rice and crip tender steamed brocolli. Tastes just like takeout, only better! We love Asian food… never thought it could be so quick & easy to make at home! Thumbs up!! I always prided myself on my own stir fry recipe but this trumps mine. The recipe items are always available in my pantry. Made this for the first time today. Very easy and good. For some reason mine came out a little sweet. Wondering what caused that so I can avoid it next time. The only hoisin sauce I found was Dynasty brand so I’m guessing that may be it? Hi Jenny, Hoisin sauce is a little sweet to begin with but there is a big difference between the different brands. I definitely prefer Kikkoman or Lee Kum Kee. Oh ya – this is good. So full of complex and tangy flavors. I even made a mistake when adding the ingredients to the chicken – I added them all at once (oops – too busy multi-tasking) – And even then my whole family loved it!!! Thank you. (I served your “Big Italian Salad on the side, too – EXCELLENT). This chicken dish was absolutely delicious! The technique for cooking the chicken was easy and the chicken came out perfect– the best. Will definitely use the technique and make this recipe again. Thank you! Seriously, every recipe I’ve made from your blog has been delicious, and this was no exception. A perfect blend of flavors! My family loves Chinese food and the Cashew Chicken recipe looks and sounds delicious. Will be making this in the near future. I loved the look of this dish so very much that I went and bought all of the fabulous ingredients and spent a happy time in the kitchen putting it all together. We spent an even happier time at the dining room table eating it! It rivals PF Changs, and I have plenty of the bottled sauces to make more!! Also – I’m gluten intolerant and was able to get gluten free Soy Sauce and Hoisen sauce and the recipe was still perfect! This tastes just like an authentic chinese recipe! Being that I’m 2nd generation chinese, I’m not well versed in chinese cooking, but thanks to your blog and recipes, I can practice cooking chinese food! My asian family/friends ate it all up! I love this recipe because it truly jazzes up boring, ol’ chicken. The cashews are crunchy and the sauce is tangy. I threw a crown of blanched broccoli in about 3 minutes before it was completely finished just to add a little more greenery to the dish. This is perfect for a quick weeknight meal, especially since I usually have most of the ingredients on hand. Another winning recipe! I’ve made your cashew chicken several times, my whole family loves it! I love the toasted nutty flavor once it’s all cooked! Yum! The flavors all blend wonderfully….and my picky toddler even gobbled up some! Thanks! My family loves this recipe! We love Chinese and now I finally have a recipe to make at home that rivals our favorite restaurant!! Thank you Once Upon a Chef!! I made this today, I added celery and water chestnuts for extra crunch. Delicious!! I love your web site. I made this cashew chicken. It was great. My kids even ate it. Since my husband and I love spicy I added some chopped up jalapeno. We are trying to cut calories so we put it over shredded cabbage instead of rice. I sauteed the cabbage in the cashew chicken for a couple minutes and it was great this way too! I made this tonight and it was scrumptious! I put in half breasts half thighs, and my family favored the thighs (although less healthy). I also added 1/4 teaspoon of crushed red pepper flakes to give it a little kick. I love that it was tasty but wasn’t oily like most Chinese takeouts are. Thanks again for another winner! That’s correct, Charlene. Hope you enjoy it! Just to be clear, you don’t start with raw cashews? Thanks. I actually have tried the Whole Foods brand and did not like it in this recipe. Definitely go with one of the others…it makes a huge difference. Hope that helps! This looks delicious, looking forward to trying it. I typically buy Whole Food’s 365 Organic Hoisin Sauce. Have you tried this one and if so do you think it is as good as the ones you mentioned? Made this for dinner last night and my family loved it so much that they fought over the last of the sauce! I omitted the cashews due to allergies, and no one missed them at all. It was so delicious – thank you!!! This is a winner! Made it tonight for the first time and it was a million times tastier than take out! Easy to make and so delicious. Thank you for giving me another great dinner idea! This was delicious, very tasty with brown rice and broccoli! I didn’t have sesame oil, but otherwise followed the recipe exactly. A new family favorite. This was such a yummy and easy recipe to make….the whole family loved it!! Thanks for sharing….. So easy to make and everyone enjoyed this as a quick dinner before heading out to a baseball game!! Thanks for sharing. Made this last night, another big hit! Who needs take-out?! This was a great recipe! My husband and I both loved it, and it was really simple. This looks delicious! I’ll definitely be trying it soon. You have a beautiful blog. I look forward to exploring it more. My husband would not be considered a fan of Chinese food but he loved this dish. I made it last night and he said it was a definite “repeat”. He has loved everything I have made from your site! Thank you! Wow, I think this recipe is really delicious,…the picture look mouth watering dish yummy. I have been on an Asian kick lately..this looks wonderous! AMAZING meal! My husband who is a very finicky eater has eaten all of the meals I have made from your blog. This one he ate up the quickest!!!! Looks great…Tried your Oatmeal cookies last night and this looks like another winner….. This looks WONDERFUL!! I’m of Asian decent, but have never really tackled the “american” favorites beyond beef and broccoli stir-fry. My family will be so ecstatic, thanks so much for this wonderful recipe, will be trying it son!